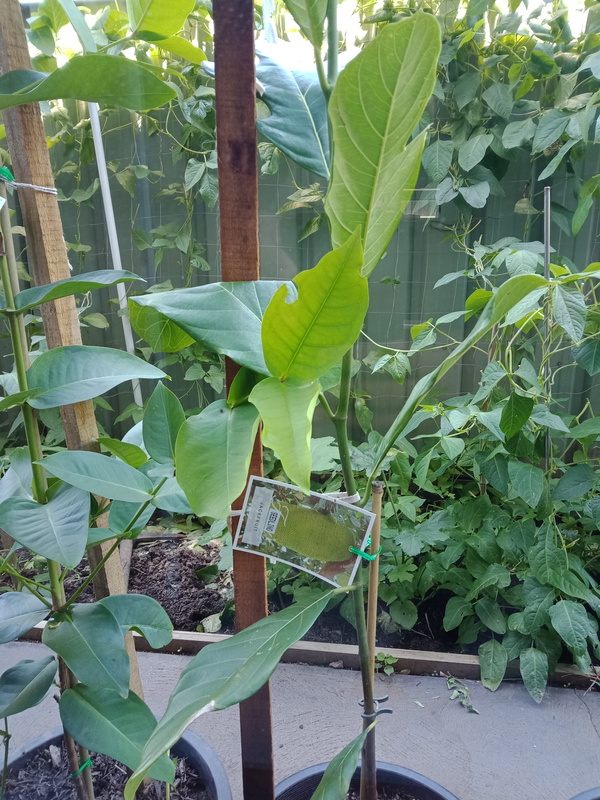 Any idea what variety of jack fruit this seedling is? Is it vietnam early? Jackfruit seedlings are not named as they are very variable. Only plants propagated vegetatively such as being grafted can be identified to a particular cultivar, hence the higher price charged. Jackfruit don't breed true to type, so the closest you would get with a variety is whether it is soft or crisp. You would only get a named variety through vegetative propagation, i.e grafts or cuttings. I haven't met anybody that could tell the difference between a soft and crisp jackfruit from the leaf, so if you have any tips on that please do share. They actually are reasonably true most of the time and usually the offspring is similar to the parent. Where outcrossing has taken place they will obviously often have characteristics of both. If a sloppy, latexy and poor quality jack is in the neighbourhood your next generation may be compromised. That info about crossing jacks is pretty interesting. I just haven't been into them. I've always considered them an absurd fruit, but just recently when I saw Daley's 'Little Jewel' pop up for sale, I thought I'd give them a try, so just bought one tree. Then considering the Little Jewel is a soft (latex free and hyped up yummers) one, I then bought a Brinsmead Special so I also had a crisp. Would these grow in NSW? Do you grow them in the ground or pots?